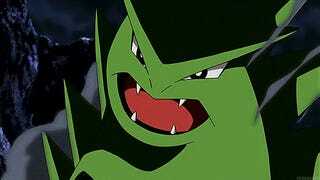 Triumphant Tyranitar! Pokemon One a Day, Series 2! 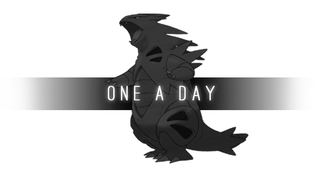 It’s Monster Hunter x Pokemon today on One a Day, as Tyranitar tramples towards the finish line of my illustrating marathon! Well...I hope it’s Monster Hunter-y enough! I studied of course the official artwork and design of creatures as well as the specialist known as Arvalis! In the end, I’m happy with the work, whether it captures the style or is more just my own take on a semi-realistic depiction of the armored titan. The keyword to the work that I focused on was armor, being the official classification. I played with the idea of being a molded carapace of sorts over the Pupitar shell, which can be seen under the opening vents of the armor, specifically the chest and the legs as seen in the official design. Where I went more rogue was with the tail, creating a functioning tail for gameplay ideas. As the creature creates a perpetual sandstorm, I imagined it needed some sort of instrument, and the tail was the best bet. The tail is slammed into the ground repeatedly, not only shaking the earth to trip up hunters, but rattles about sand/dust/rock/debris that it has ingested prior. I also imagine the rocky spikes on its back also release sand through small holes. Other than that, I just focused on translating as much as I could from one rendition to the next. In the end, I feel it’s a bit close and I could have taken more liberties with the design, like really absorb similar designs from monsters and play Frankenstein but for a first time attempt, I think it turned out OK! And that’ll wrap things up for me here...No rest for the weary! It’s onto the next one (or two) and I’ll keep things up to make sure the series gets to go out with a bang. Thanks guys! Exploring the creatures of Gold and Silver, Pokemon One a Day Series 2 can be seen as both a standalone project and expansion to the original marathon of artwork that sought to present one unique new illustration per day. This project builds upon the exploration of personal technical and philosophical concepts and visual styles under daily deadline to create quality works for personal and professional growth. Learn more about the artist, Bonny John, at www.bonnyjohn.com ! There you’ll find links to his YouTube, Twitter, Tumblr, and DeviantART accounts, in addition to his other bodies of work!